Douglas Sirk was one of the 20th century cinema’s great ironists. And perhaps the most distinctive characteristic of the films he made in Europe and America is the way they are able to create a gulf between how his characters see themselves and our view of them. Sirk’s characters grapple with the same problems that have always afflicted men and women and parents and children, to do with love, death and social circumstance. In some cases, they do so in a world of melodrama – as in films as various as Schlussakkord (1936), La Habanera (1937), There’s Always Tomorrow (1955) and Imitation of Life (1958). In others, it’s a world of colour and music – as in the trio of comedy-musicals he made during the 1950s, Has Anybody Seen My Gal? (1951), Meet Me at the Fair (1952) and Take Me to Town (1952), part of a series he had planned about small town America. In others, it’s the excitement of mystery, romance or adventure – in films such as Lured (1946), Taza, Son of Cochise (1953, shot in 3-D) and Captain Lightfoot (1954). But Sirk adds another layer to the shape of the films and to his characters’ struggles within them. All around, but beyond the reach of their vision, are forces which define the parameters of their lives. These are evident at the most basic level, in the way that the plots almost always hinge on problems for which the only solution becomes a convenient miracle, a deus ex machina. As Sirk told an interviewer in 1973, “These happy endings all express the weak and sly promise that the world is not rotten and out of joint but meaningful and ultimately in excellent condition. One could follow these thoughts endlessly through Dante, Molière, Calderon and even in the grandiose, celestial, operetta-like ending of the second part of Faust” (2). There’s also an air of fatalism in the way that social customs and the material world acquire lives of their own in Sirk’s stories, stifling the characters’ sense of what’s possible and limiting their options. From La Habanera through Has Anybody Seen My Gal? – which begins with a caption reading “This is a story about money. Remember it?” – to Written on the Wind (1956) and The Tarnished Angels (1957), characters’ choices seem to be determined by a combination of ideological decree and financial circumstance. Most compellingly of all, forces of repression are signalled through Sirk’s imagery. In his work, mise en scène is as crucial to meaning as narrative form, his often baroque visual style pointing to the ways in which human aspiration is largely determined by the tenor of its surroundings. Homes that are supposed to be havens start to look like prisons as the decor comes to dominate the compositions. Objects that are supposed to be items of support actually seem to be taking over the characters’ lives. Their traumas become the logical extensions of the workings of the world around them (3). 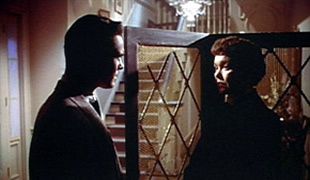 In All That Heaven Allows (1955), a New England widow (Jane Wyman) falls in love with her gardener (Rock Hudson), much to the disapproval of the local community and her grown-up children. They have other plans for her: a television set and a suitor of her social standing (Conrad Nagel), a nice man but dull man. In Sirk’s hands, this troubled romance becomes an indictment of the social mores that make it troubled, mores that not only exist outside the central figures, in the ways that others treat them, but that also seep through their own behaviour and the ways in which they think about themselves. In such a context, characters who had seemed to have overcome their problems emerge in a very different light. Endings that might otherwise be deemed to be happy become far less reassuring. Subversive ironies cast a shadow across any sense of achievement, not so much invalidating it as offering other ways of viewing it. 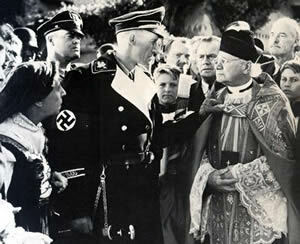 The miracle that brings The First Legion (1950) to a close might persuade Father Arnoux (Charles Boyer) and Dr. Morell (Lyle Bettger) of the existence of God and the power of faith, but Sirk ensures that we also understand both the event and their reaction to it as an indication of the final incomprehensibility of the world and of their limited understandings of their place in it. The resolutions to Magnificent Obsession (1953) and Battle Hymn (1956) work in much the same way. 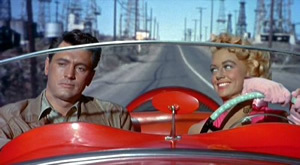 While acknowledging the changes that have taken place in the lives of their protagonists (both played by Rock Hudson) and their heroic efforts on behalf of others, the films also call into question the nature of their spiritual conversions, suggesting the two men’s limited grasp of the personal needs that have been driving them. 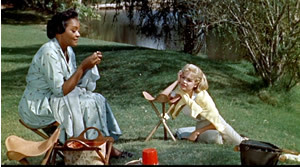 Although a much more developed analysis is needed to make these points persuasively, Sirk’s observations to Jon Halliday in relation to Imitation of Life are especially pertinent to the view of the world that emerges through his work: “There is a wonderful expression: seeing through a glass darkly. Everything, even life, is inevitably removed from you. You can’t reach, or touch, the real. You just see reflections” (4). Sirk is now entrenched as one of the most esteemed of Hollywood’s auteurs. But perhaps the most astonishing facet of his career is that it wasn’t until long after he left Hollywood for Switzerland at the end of the 1950s that any serious critical attention was paid to his work. In the April 1959 issue of Cahiers du cinéma, Jean-Luc Godard wrote an enthusiastic piece about A Time to Love and A Time to Die, Sirk’s anguished 1957 adaptation of the Erich Maria Remarque novel of the same name (5). But it was the April 1967 issue of Cahiers du cinéma that really set the ball rolling, including an extended interview conducted by Serge Daney and Jean-Louis Noames, a thoughtful (and influential) appreciation written by Jean-Louis Comolli, entitled “L’aveugle et le miroir ou l’impossible cinema de Douglas Sirk” (“The Blind Man and the Mirror or The Impossible Cinema of Douglas Sirk”), and a “biofilmographie” compiled by Patrick Brion and Dominique Rabourdin. Published in 1968, The American Cinema, Andrew Sarris’ pioneering book on American directors, placed Sirk on “The Far Side of Paradise”, somewhat elusively observing that “the essence of Sirkian cinema is the direct confrontation of all material, however fanciful and improbable” and drawing attention to his distinctive visual style. But it wasn’t until the publication of Jon Halliday’s seminal, book-length interview in 1971 that Sirk became known in the English-speaking world as something more than the director of glossy melodramas and other genre films at Universal. The Sirk that emerges from the interview is a sophisticated intellectual, a filmmaker who arrived in Hollywood with a very clear vision, leaving behind him an established career in German theatre and film. Several probing articles by writers such as Paul Willemen and Fred Camper published in the British theoretical journal, Screen (Summer, 1971) further enhanced Sirk’s prestige. They were followed by the programming of a 20-film retrospective at the 1972 Edinburgh Film Festival, at which Sirk was a guest. The event further solidified his reputation and led to the publication of a book of essays, edited by Halliday and Laura Mulvey. It offered some new material as well as a selection of articles originally published elsewhere, including Thomas Elsaesser’s translation of Rainer Werner Fassbinder’s tribute to Sirk (which first appeared in Fernsehen und Film in February 1971) and an essay by a budding young American director named Tim Hunter on Sirk’s Chekhov adaptation, Summer Storm (1944). In 1974 the University of Connecticut Film Society programmed an ambitious tribute to Sirk, offering a complete retrospective of the director’s American films and inviting him to attend. However, on the way to the airport for the flight to New York, Sirk suffered a haemorrhage that seriously impaired the vision in his left eye, an ailment that was to trouble him for the remainder of his life. “If I couldn’t read, I couldn’t live”, he said shortly afterwards. But it wasn’t long before he lost the sight of his other eye (6). However, his reputation was established, even if he felt uncomfortable with some of the terms in which his work was generally being discussed. In particular, he was uneasy about the way he’d been cast as an unequivocal critic of the American way, a strategy that was central to Halliday’s account of his work as a commentary on “the barren ideology” of 1950s America. Much of the subsequent writing on Sirk’s films took up Halliday’s approach (7), casting the director as something akin to a latterday Bertolt Brecht, identifying his methods of “distanciation” as a way of casting a critical eye over the failures of the American bourgeoisie. While acknowledging Brecht’s influence and expressing his admiration for him (he had directed a production of The Threepenny Opera in Germany), Sirk was uncomfortable with the way his work was being depicted in the same light. The image of the robot figure that opens There’s Always Tomorrow reflects something of the way its protagonist (Fred MacMurray) is living his life, but not the torment he suffers during the course of the film. Here and elsewhere, Sirk’s films offer critiques of their characters, but also extend to them an understanding and an empathy that acknowledges their humanity. 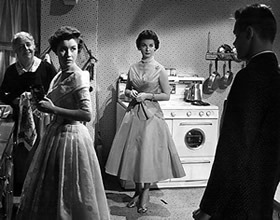 While Sirk was delighted to find that the social critiques embedded in his work were being recognised, he was dismayed by the way it was often reduced to its didactic elements. “When I went to the United States,” he recalled in 1975, “I was making films about American society, and it is true that I never felt at home there, except perhaps when my wife and I lived on a farm in the San Fernando Valley. But I always wanted my characters to be more than cyphers for the failings of their world. And I never had to look too hard to find a part of myself in them” (8). It was a view he further elaborated upon in an interview with Peter Lehman in 1980. “You have to think with the heart,” he said. “There’s a thinking of the heart, too. At the same time as you can be an intellectual; you can be very sophisticated. I think the great artists, especially in literature, have always thought with the heart” (9). Much of Sirk’s critical reputation currently rests on four of the melodramas he made during the 1950s: All That Heaven Allows, Written on the Wind, The Tarnished Angels and Imitation of Life. Some recognition has been given to three other films from this period, including All I Desire (1953) (10), There’s Always Tomorrow (11). and A Time To Love And A Time To Die (12). And four of the films he made in Germany – Stutzen der Gesellschaft, his 1935 adaptation of Ibsen’s Pillars of Society, Schlussakkord, the Australia-set Zu Neuen Ufern (To Distant Shores, 1937) and La Habanera – have received a limited amount of critical attention (13). However, a large area of his work still remains critically untapped, in particular the aforementioned comedy-musicals, the neurotic comedies – The Lady Pays Off (1951), Weekend with Father (1951) and No Room for the Groom (1952) – as well as other estimable films such as A Scandal in Paris (1945), his favourite, Taza, Son of Cochise and Captain Lightfoot. A major reason why they haven’t received the attention they deserve is that it has now become almost impossible to see them, although A Scandal in Paris was recently released on DVD (14). Sirk was born Hans Detlef Sierck on April 26, 1900, in Hamburg (15). His parents were Danish, his father a newspaperman. By the time he was 14, he had discovered the theatre, in particular Shakespeare’s history plays. He had also begun to frequent the cinema, where the Danish-born actress Asta Nielsen became a favourite and where he had his first encounters with what he was later to describe as “dramas of swollen emotions”. In 1919, he enrolled to study law at Munich University, before moving to Hamburg University, where he turned his attention to philosophy and the history of art. Years later, he still remembered lectures delivered there by Albert Einstein and Erwin Panofsky. To finance his studies, he wrote for newspapers and began to work in the theatre. 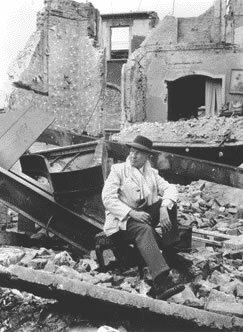 In 1922, he directed his first production in Hamburg, Hermann Bossdorf’s Bahnmeister Tod (Stationmaster Death), and began a career that saw him become one of the foremost theatre directors in Weimar Germany. While continuing that side of career, which he was finding increasingly stressful in the context of the social changes of the time, he also began work at Ufa studios in 1934. He directed three shorts there before making his first feature, April, April, in 1935 (shot twice, first in Dutch and then in German). At the same time, he had an intense interest in painting (which he pursued in his spare time) and in the art movements of the period. Bored by expressionism and dismayed by the gradual shift to more realist forms, he subsequently identified two 19th century painters, Daumier and Delacroix, as leaving “their imprint on the visual style of my melodramas”. He made seven more films at Ufa, before leaving Germany in 1937 to join his second wife, Jewish stage actress Hilde Jary, who had gone to Rome not long beforehand. While there were admirers of his work in high places in Hitler’s Nazi government – Goebbels foremost among them –he had become increasingly disillusioned with what was happening in Germany. But the chief reason for his hasty departure was the public denunciation by his first wife, Lydia Brinken, of his relationship with Jary and his fear of the consequences. After his departure, he never saw Brinken or their son again. Arriving in the US in 1941, he got his first chance behind the camera on Hitler’s Madman (1942), which provided him with an opportunity to dramatise some of the madness he’d been able to leave behind. Then came Summer Storm, which was based on Chekhov’s The Shooting Party and led to a long friendship with George Sanders, whom he later described as “really the only actor with whom I had anything in common in Hollywood”. Sanders also starred in his next two films. Sirk’s star gradually ascended in America, his partnerships with producers Ross Hunter (nine films) and Albert Zugsmith (two) at Universal International especially fruitful. 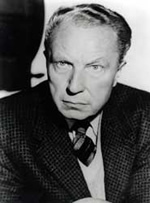 When he visited Australia during the early 1970s, Hunter remembered Sirk as “a sweet man, but very out of place in Hollywood”. For his part, Sirk found Hunter equally congenial company, even if they were on entirely different wavelengths. Zugsmith gave him his freedom, for which he was grateful, and he would speak of “Zug” with affection, although he also confessed to finding the cigar-smoking mogul “awfully crass”. His affair with Hollywood was very much a love-hate relationship. While he enjoyed the challenge of “bending the material to my style” in an environment seemingly designed to cramp his creativity, neither he nor Hilde ever felt comfortable with its excesses. He remembered being shocked when he went to a party at Zugsmith’s lavish LA home and found “naked women frolicking in the pool”. Partially because of his ill health, but largely because he’d had enough, he and Hilde left the US in 1959, never to return. Until his death in January 1987, they lived in Lugano, their hillside apartment on Ruvigliana looking out over the beautiful lake. It provided them with the peace and the solitude they loved, although they regularly greeted friends from afar (16). Encouraged by Fassbinder, with whom he became friendly after the then-enfant terrible of the German cinema visited him in Lugano, Sirk also did some teaching during the late 1970s at the film school in Munich, where he made three short films with his students. During the last decade of his life, he was still, as he put it, “studying the classics” and being excited by more recent discoveries, especially the work of Gabriel Garcia Marquez and Patrick White. Jon Halliday, Sirk on Sirk, Secker & Warburg, London, 1971 & 1997. Laura Mulvey & Jon Halliday (eds), Douglas Sirk, Edinburgh Film Festival, 1972. Michael Stern, Douglas Sirk, Twayne, Boston, 1979. Lucy Fischer (ed. ), Imitation of Life: Douglas Sirk, Director, Rutgers, 1991 [screenplay and essays on Sirk’s final Hollywood film]. Bright Lights, Winter 1977–78 [an issue devoted to Sirk]. Film Criticism, vol. XXIII, nos 2–3 Winter/Spring 1999 [special Sirk issue]. DVD reviews of All that Heaven Allows and Written on the Wind. Short expositions on Hitler’s Madman and Sleep, My Love. Article on Sirk’s use of space and Written on the Wind. Jon Halliday, Sirk on Sirk, Secker & Warburg, 1971 (first edition), p. 70. Wolfgang Limmer, Suddentsche Zeitung, November 17–18, 1973, translation from the original German by Virginia Soukup. Todd Haynes develops this aspect most effectively in Far From Heaven (2002), his dramatised celebration of Sirk’s work. Halliday, op. cit., p. 130. “Anguished” in large part because Sirk had discovered that his estranged son, Claus, a child-actor in Germany during the 1930s and early ’40s and a former member of the Hitler Youth program, had been killed on the Russian Front (as happens to the John Gavin character in the film). Sirk requested that this information not be made public until after his death. The introduction to the second edition of Halliday’s book (1997) offers a moving account of this period of Sirk’s life. The second edition of Halliday’s book replaces his original introduction with a new one, describing Sirk’s work in very different terms as “warm-hearted, often humorous and always beautifully crafted portraits of human emotions – especially of difficult choices requiring unusual courage, and of love in extreme circumstances or love thwarted” (p. 2). The general tone of the interview, of course, remains the same, although new material has been included. From a series of previously unpublished interviews conducted with Sirk by the author in and around his apartment in Lugano between April 1975 and May 1981 (all other uncredited quotes come from this source). Lehman’s useful interview appears in the American journal Wide Angle, vol. 3, no. 4, pp. 42-47. Most notably by Michael Walker in Movie, no. 34–35 (UK), pp. 31–47; see also Lucy Fischer, “Sirk and the Figure of the Actress: All I Desire” in Film Criticism, vol. XXIII, nos 2–3 (a special Sirk issue), pp. 136–149. Jeanine Basinger, “The Lure of the Gilded Cage” in Bright Lights, Winter 1977–78 (an issue devoted to Sirk), pp. 16–19; Michael Stern, Douglas Sirk, Twayne, 1979, pp. 111–134; & Amy Lawrence, “Trapped in a Tomb of Their Own Making: Max Ophuls’ The Reckless Moment and Douglas Sirk’s There’s Always Tomorrow, in Film Criticism, vol. XXIII, nos 2–3, pp. 136–149. Jean-Luc Godard’s review of the film is translated into English in Tom Milne (ed. ), Godard on Godard, Da Capo Press Inc., 1972, pp. 134–139; see also my article in The Australian Journal of Screen Theory, 1976, no. 4, pp. 49–57. See the collection of articles in Film Criticism, vol. XXIII, nos 2–3, pp. 1–94. Much of my research on Sirk and his work was done during the second half of the 1970s and belated thanks are due to Robert E. Smith and John Belton in New York, and the National Film Archive in London for their assistance. And, also belatedly, to Jon Halliday, Jean-Loup Bourget, Robin Wood, John Anderson and Virginia Soukup for their support and advice. Halliday’s second edition suggests that Sirk was, in fact, born in 1897 (citing his passport as evidence). He and Hilde were always eager to hear news of others who had followed the same route to his door that I had. I think the Sirks figured us as a small group of friends who took it in turns to visit them, rather than admirers from different sides of the world who, for the most part, had only them in common.